Most of you reading this post might have wondered – who needs a USB hub? There’s nothing particularly exciting about a USB hub and every computer has 2 or 3 of those. So, why do you need a new USB hub? Believe me – When you get a USB 3.0 working, things start to get interesting. If you’ve witnessed the transfer rate difference between USB 2.0 and USB 3.0 – you’ll understand what I’m trying to say. Connecting external drives on through USB 3.0 gives you smokin’ performance. 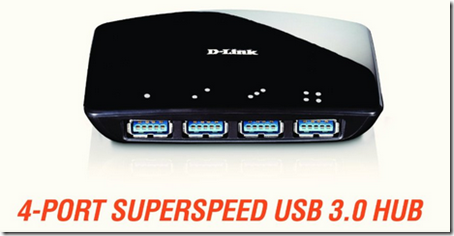 The USB 3.0 I used for this review is the D-Link SuperSpeed DUB-1340. The D-Link 4-Port SuperSpeed USB 3.0 Hub (DUB-1340) provides 4 additional USB 3.0 ports for your PC, allowing you to connect USB devices such as external storage, digital cameras, printers, and more. You get data transfer rates of up to 5Gbps – 10 times faster than USB 2.0. You can transfer your photos, music, and HD movies to a USB 3.0 external storage device faster than ever before. Without doubt the greatest advantage you get is that USB 3.0 allows you to transfer data at blazing speeds of up to 5 Gbps – up to 10 times faster than USB 2.0. You can back up your photos, music, and HD movies to a USB 3.0 external storage device faster than ever before. Each port delivers up to 900mA of power with the included power adapter for faster charging and power hungry USB devices. It works with both Windows and Mac and is hot-swap compliant. Try D-Link USB 3.0 and get the best and seamless connection you’ve been looking for. D-Link SuperSpeed was selling for $45 through Amazon at the time of this review.